I am counting down the days. And, it’s only 2 weeks away!! I know that the way to my husband’s heart isn’t gifts, but I still like to buy him a few things for Valentine’s Day. 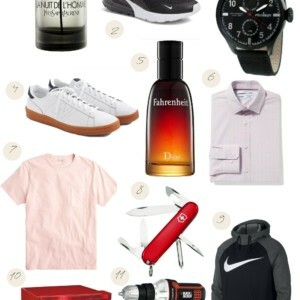 I have already purchased some of these items for my hubby, and some are on the list to purchase. By the way, I have stolen Mike’s Shiatsu back massager. It’s amazing!!! 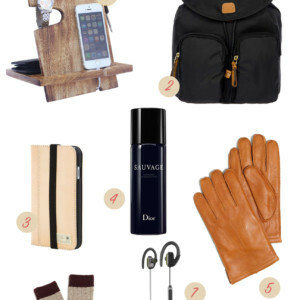 Hope that this gift guide will help a few of you with shopping for your man. 1. Viktor & Rolf Spicebomb set is worth the money. This is both of ours favorite cologne!!! It’s divine!!!! 2. Daniel Wellington classic Durham watch is by far the classiest. I love the mix of brown and black. 3. Under Armour Seemless hoodie is a classic hoodie that is lightweight enough to wear throughout each season. 4. The North Face travel kit is a great gift that he can use for years to come. It beats using a ziplock to travel with the toiletries. 5. Shiatsu Back & Neck massager has been one of best purchases for under $40. You both won’t regret this purchase. 6. Under Armour Camo joggers don’t need an explanation. 7. Swell Stainless Steel bottle is a great gift especially for those who drink water and coffee. 8. Nike Huarache tennies are a great pair of shoes. They have them in multiple colors. And, they are on sale.